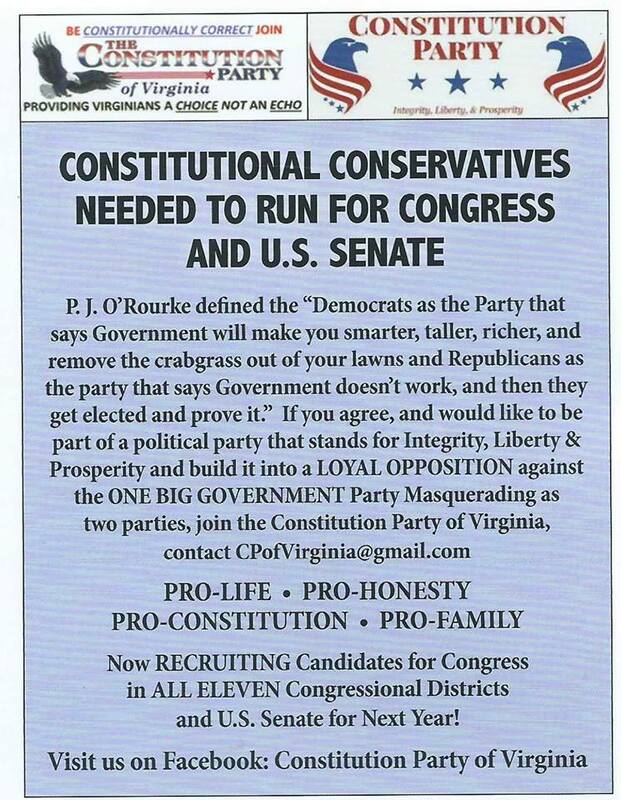 This is the official website of the Constitution Party of Virginia. Chairman John Bloom saw an advanced screening of the movie "Unplanned." He recommends this movie which opens in theaters Friday March 29. It tells the story of a Planned Parenthood employee who turned against abortion. It is rated R due to the violence that is synonymous with abortion. Please click here to see our press release. If you are interested in running to be a member of the US Senate or House of Representatives, or State Delegate or State Senator, please contact John Bloom at CPofVirginia@gmail.com. The Constitution Party was represented at the Conservative Political Action Conference (CPAC) which occurred at National Harbor, Maryland, February 27 to March 2. The effort was financed through the Constitution Party of Virginia. Randy Stufflebeam from Illinois, Bryan Bending from Ohio, John Bloom and Paul Provance from Virginia, worked the booth. We collected contact information from people from six different states that we forwarded to the respective chairpersons for follow-up. Additionally we talked to many more people who we gave our information to, and hopefully they will be inclined to contact the Constitution Party in their states. We were fairly busy for the 15 hours that the Hub was open, with activity nearly constant. Randy interviewed a wide variety of attendees, including Matt Waters, Libertarian candidate for US Senate in Virginia. John was interviewed by CSPAN, which occupied the next booth over from our location. Thanks go out to Constitution Party members in New York, Massachusetts, Michigan, Ohio, Illinois, Indiana, and Virginia who contributed to the effort and made our appearance at CPAC happen. Congress voted overwhelmingly to block President Trump's unconstitutional executive action, to misappropriate funds by declaring a national emergency. The Constitution Party of Virginia commends each and every member of the House of Representatives and Senate who voted for the resolution, both Democrats and Republicans, for defending the Constitution of the United States. Please click here to see our press release. President Trump has acted unconstitutionally in falsely declaring a national emergency in order to redirect funds appropriated by Congress. Please click here to see our press release. What Kind of Nation Will We Leave Our Children? For too long, both major parties have ignored the religious and cultural values that once bound our nation together. We in the Constitution Party seek to reverse this failure in our system. We must force our government to act responsibly, and safeguard our people and its way of life. We dare to be normal, peaceful, and frugal. We dare to enter the future while holding fast to the truths of the past. Join us as we advance toward a better future of integrity, liberty, and prosperity. Constitution Party of Virginia (CPV) Chairman John Bloom and Treasurer Paul Provance attended the Constitution Party National Committee Fall meeting on November 16 and 17, 2018. The two day conference was held at the Embassy Suites Hotel in Irving Texas near the Dallas-Fort Worth International Airport. The CPV is increasing its participation at this semi-annual event, but was not yet able to field the five members it is authorized for the National Committee meeting. The first day was for training and strategy sessions. One session was given by David Kopacz of Massachusetts who described his efforts to form a party in his state. His party was accepted into the National Party as the Massachusetts State Affiliate the next day. The second day was filled with discussion on bylaw amendments and resolutions from 8:00 a.m. until after 5:00 p.m. One resolution that was put into effect by administrative action was proposed by our own John Bloom. A direct link for state party donations will soon be available on the National website. Three bylaw changes were passed at the meeting, one corrected some ambiguous language, one restricted voting on bylaw changes at National Committee Meetings to people physically present when meetings include video conferencing, and one increased membership on the Executive Committee to include all former vice-presidential nominees and all past chairmen. Paul Provance and John Bloom look on as Dave Kopacz accepts party affiliation for Massachusetts. What is the Proper Succession of the Attorney General? It is the Constitution of the United States and law passed by Congress that determine Attorney General Succession, not the President. Please click here to see our press release. If you think you might be interested in supporting the Constitution Party of Virginia, by signing a nominating petition, by collecting signatures on a nominating petition, or by running for US House of Representatives or US Senate, please fill out this volunteer questionnaire. The Constitution Party of Virginia is organizing statewide. Contact John Bloom at CPofVirginia@gmail.com to get involved. The Constitution Party is organizing in Northern Virginia. If you live in Northern Virginia and would like to become active in helping to grow our Conservative Alternative, contact Paul Provance at prmtprovance@cox.net to get involved. NOTE. The material and/or views found on this page and local linked pages are not necessarily the official views of the Constitution Party.